When I first started planting tulips several decades ago, I had the worst luck. If it wasn’t some hungry little mouse eating the bulbs, a family relative going through a vegan stage picking and frying them. Yes, tulips are edible although I can’t remember them to describe the taste. 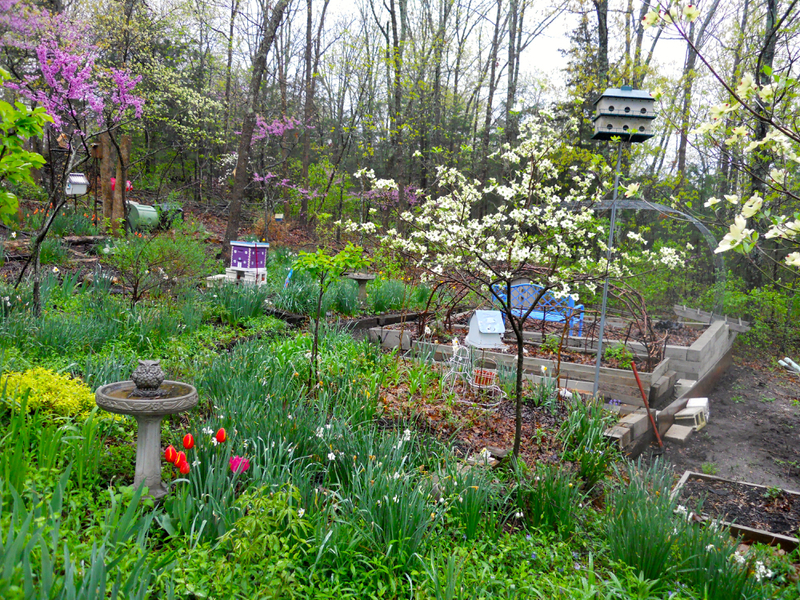 When I moved to the house on my one acre Missouri limestone hill, I swore off tulips, opting to plant daffodils and related natives for spring color. Last fall, however, my gardening buddy gifted me with a huge box of discounted bulbs including tulips. It was such a lovely, exciting gift that I got to planting them. Also helped that the first hard frost was in the forecast for about a week later. Winter has been colder than usual but it’s still a bit of a gamble how many bulbs will make it without becoming food for mice and squirrels. This spring, in addition to the regular spring colors of pink Eastern Redbuds, vanilla white Dogwoods, blue Grape Hyacinths and flowering vinca, I now have a lovely pop of red, yellow and purple color courtesy of these gift tulip bulbs. This is the flower bed across the driveway from my concrete bunnies. I see this flower bed as I walk up the driveway to my garbage can and down the road to my mail box. As I return from my mailbox, I detour to a path that takes me to one of my memorial seating areas. This one is for my Uncle Tony, who lived in Louisiana. The little pop of red tulips brightens up this corner while other summer-blooming plants get their start. Another way to approach my house is through this series of round concrete steps leading to, and from, the front door. Sometimes I walk down the road and return to my garden through these steps so I lined them with a little pop of tulips as well. Frankly I don’t have large swaths of available soil to plant so I sneak tulip bundles in where I can and still protect them. Rainy days mean time spent in reading nooks through my house so I added a little plop of tulips where I could enjoy them from a window seat. This view out one of my windows made me think I really should add one of my Pink Tullp Quilts on my bed, then I thought no, I have enough tulips around me as it is. This little clay pidgeon has been with me for more than 20 years so I gave her a little embellishment by planting orange tulips around the path that leads to her sitting spot. Back to the other side of the garden, where I am walking back to the house from Uncle Tony’s memorial bench. 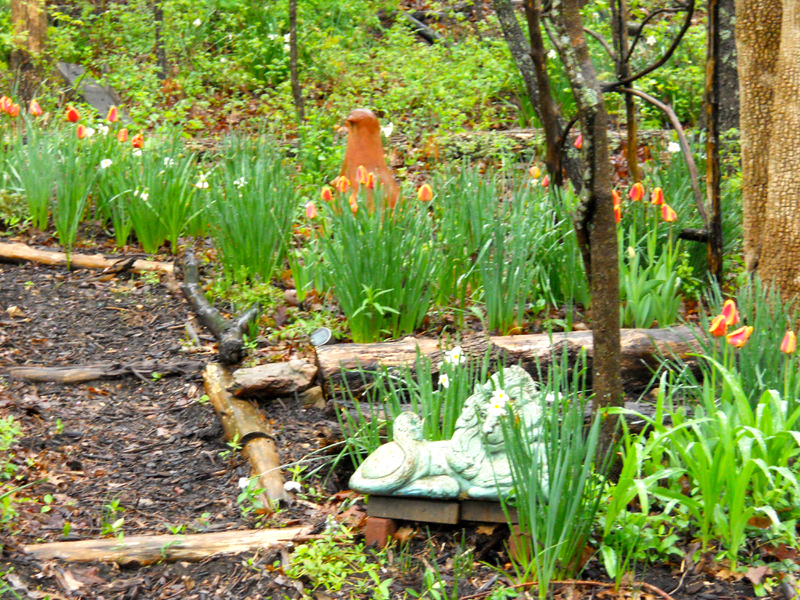 The path leads by my driveway retaining wall, which now has little bouquets of blooming tulips. You can see staining from how the water perculates through the wall, giving it a nice aged look. This will be the third year for the retaining wall plantings and I am looking forward to seeing how it grows. As I walk down the path to the back of my house, I added another small bundle of tulips at the bottom. Once they stop blooming, other plants will take over and hopefully give them some cover so they will return next year. Thanks to my gardening friend Tom for this lovely gift of spring color, I hope it’s a gift that keeps on giving! If there is one native Missouri flower that represents spring to me, it’s wild violets, viola sororia or “sister,” because it looks so much like other violets. I remember “discovering” these native flowers many decades ago in a field behind where I was living. It was in a neighborhood without street lights so it was easy to sit outside and gaze at stars at night, then walk through the field and try to find flowers. Common violets can vary in color from a dark, almost navy color to the light lavender here, which reminds me of the lavender applique cat in our Pastel ABCs baby quilt, which I am currently working on as a custom gift. There are other Missouri native violets living in my garden. Some have moved in on their own, others have been invited in, such as these white violets with purple accents. I also have yellow violets in one spot - don’t ask, I don’t remember where so I need to wait for them to bloom - and all white violets, which I planted at the entrance to my house so I can enjoy them every day. These wild violets are not only pretty March-June but the flowers are edible and high in Vitamin C. Since I don’t use toxic chemicals in my garden, I can pick a handful of flowers and add to a salad. Not only is the color pretty but I am adding vitamin C and a little tartness to my meal. I confess, I also love the look of them on my plate. These are also welcome resting spots for bees and other pollinators, and their heart-shaped leaves add a nice contrast to other garden greenery. I tuck these in at the front of flower beds wherever I can. don’t know why some people find these plants to be unwelcome, we have to rethink our standard of beauty being a sterile green carpet. These are the plants we should welcome into our gardens! There are a number of ways people mark the arrival of spring. Purple crocus; yellow daffodils in bloom; maybe a favorite tree blooming. In my world, it's lettuce. In addition to a dedicated vegetable garden spot, I keep a series of pots on my back deck where I can easily access herbs and greens. Sometimes the potted garden grows faster. It's on the equivalent of a second deck surrounded on three sides by glass. It also faces west so the soil warms up faster than the vegetable garden. 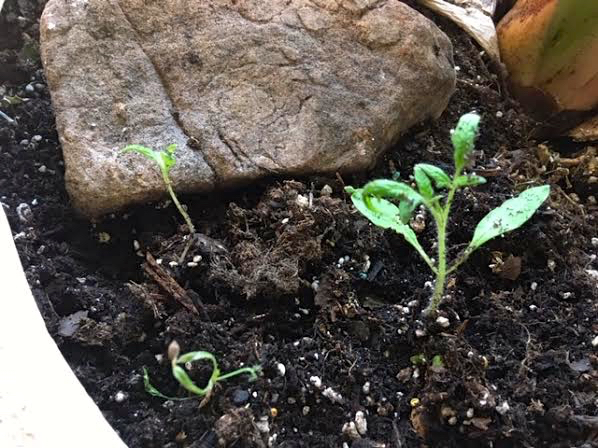 To get an early start on vegetables and herbs, I usually have a pot share lettuce seeds on one side and an herb on the other. I use shards from broken pots to set up growing guides. This year, lettuce is sharing space with sweet basil. When I harvest my first greens for a salad marks the official beginning of spring for me. It's a healthy, delicious and easy way to start! One of my favorite summer flowers, nasturtiums, can be hard to get started. The round seeds have a hard cover, making germination difficult. One year out of a packet of 25 nasturtium seeds, only three sprouted. To more easily get nasturtiums germinating, soak seeds in water for 1-2 days. Seed coverings will soften so that seedlings can more easily pop through. Once I started soaking seeds, I had 100% germination. Besides being bright and pretty, nasturtiums are wonderfully edible, adding a spicy flavor to salads and desserts. Now that's my kind of combination!